Ina Garten is #39 on Gourmet's list of Women Game-Changers in Food. She is known for using fresh ingredients and de-mystifying recipes so that the average home cook can truly make them. Her circular path to the top of the Food Empire is well-known. She spent years in Washington D.C. as a White House Nuclear Policy Analyst. Somewhere along the way there was a seemingly impulse buy of the Barefoot Contesssa (A gourmet food store) in the Hamptons. (This is one smart woman - not sure how much of an "impulse buy" this truly was!) 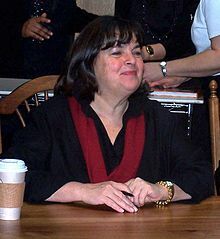 The Barefoot Contessa led the way to creating recipes for her store. She was mentored by such luminaries as Eli Zabar (from Eli's Manhattan in NYC) and Martha Stewart. Cooking and catering led to cookbooks. Cookbooks led to a cooking show and Garten remains on the map as a mover and a shaker in the food world. I own two of her cookbooks. My husband's side of the family is - numerous! When I have a family gathering 40-45 people of all generations will show up.That is not the time to try out your 12-step recipe! I have found her recipes add elegance to the proceedings and her food is packed with flavor - because the woman is not afraid of using fat! It's been written that the ease and success of her recipes is because she is very careful to have the recipes tested by others again and again before she publishes them. I chose Garten's Warm Mushroom Salad from Barefoot in Paris. In the opening paragraph, Garten admits, "It's Italian!" Mushrooms - you love them or you hate them (especially if you are a child). In this recipe - you love them. There's an early spring brewing around the country. Although in Minnesota - we are skeptical. "Does this mean it will snow for 8 months next year," asks my daughter. "Does this mean we will have 100-degree weather all summer," I muse. A smart person would tell us to turn off our thoughts, get outside and enjoy the early warmth. Think of this March as a gift - instead of worrying what Mother Nature in Minnesota is really planning! The warm mushroom salad is indeed perfect for spring - it's fresh, a tad meaty (and you can certainly omit the prosciutto to make it vegetarian; all right - you want vegan? Eliminate the cheese, too!) Garten suggested cremini mushrooms for this - I used a mushroom blend. Portobello mushrooms would also be delicious in this. It's hearty enough for a proper lunch. And if I had leftovers - I would be nibbling this for breakfast. Clean mushrooms by brushing them with a sponge - do not wash or immerse in water. Remove stems and save for another use (I just used them.) Slice the caps 1/4 to 1/2 inch thick. In a large saute pan, melt the butter and 2 tablespoons of the olive oil. When all is bubbly add the mushrooms, salt and pepper. Saute 5 minutes over medium heat - stirring. Lower the heat and saute another 2-3 minutes until cooked. Arrange arugula on plates - 1 cup for each plate. Drape your prosciutto over the arugula. When the mushrooms are cooked, add the sherry vinegar and the remaining 2 tablespoons of olive oil. Stir. Spoon the warm mushrooms on top of the arugula and prosciutto. With a vegetable peeler, shave parmesan on top of all. Sprinkle Italian parsley and sun-dried tomatoes about. Finish with a bit more of the salt and pepper. Serve. It's perfect. It's spring. It's robins in my backyard, ducks in my front yard and geese flying overhead. Please check out what the other bloggers are doing for Week 39 of Female Chef Gourmet Game Changers. And if you want to join in the fun, e-mail Mary at One Perfect Bite. Mary started this delectable journey. great and simple recipe - i love having a little something warm in my salad! I love Ina garden..Thanks for the salad recipe.. So glad to see you cook this recipe, it's one I haven't tried. I agree with you that her recipes are perfect for entertaining, they make you look like the perfect hostess. I am such a Barefoot Contessa fan, in part for exactly the reason you mentioned--her recipes are almost fail-safe. This salad is gorgeous--that top photo has me thinking about this weekend's dinners already. New Jersey has also been blessed by an early spring…I’m not questioning…just going to enjoy it! Your salad looks fabulous! Such a wonderful pick for Ina! Nicely done! I'm not much of a bacon eater, but bacon really sounds like it would be great in this salad with those beautiful mushrooms. I make Andrea Robinson's mushroom salad and it's always a huge hit; this looks lovely, too. Thanks for the sweet pics! Can'y go wrong with mushrooms and prosciutto. Awesome. It's been Spring-like all winter for us! Some say that it means we won't have a hot summer. I tend to think the opposite. I love Ina - I don't make enough of her recipes. This looks wonderful! Claudia- I have also been wondering if we'll be having 100 degree + weather this summer. In that case I guess I'll be spending the summer indoors in my kitchen :) I can't deal with high temps like that. This mushroom salad looks so savory and delicious. Ina always hits it on the mark. She is such a go to for recipes. You really sing spring here... love this combo as always a delicious wonderful post! Claudia, this looks awesome! Those warm mushroom with the prosciutto and parmesan....it's just yummy. I love the way you have presented it looks very inviting. Maybe I could persuade my husband to eat some mushrooms without frowning. The salad looks so delicious! I love it. I'm not sure if I've tried sherry vinegar. Oh this salad makes me hungry and looks awesome! Very lovely salad for spring weather (it's still winter weather this week and weekend in SF though). I am embracing the unusually warm weather - and would be embracing that salad too if you lived closer. Ina's recipes are always winners in my book. Ina is a woman who is a very nice example to many and I've picked up a few cues from her in the past as well. Very nice posting Claudia. Hope everything is well, especially now that Spring is much closer. You can never go wrong with an Ina recipe, and yes perfect for those family reunions when something tried and true is required. Ina remains one of my all-time favorite cooks. You are right she has a way of 'de-mystifying" food ingredients. I can't say that I have ever enjoyed an earthy mushrom salad-love mushrooms so I know I would love this too. Ina is a favorite of mine and with her passion for creating she has had a wonderful career. I have never put mushrooms in a salad before, but after seeing this-that has to change! This is a healthy and tasty creation. Glad you posted this. Hope you are enjoying your weekend! I used to order a mushroom salad from a now defunct restaurant...I need to try Ina's...it sounds fabulous!!! I love the sound of this Warm Mushroom Salad - beautiful! I confess I don't know Ina very much...you know, cooks is a question of continents too..but your salad looks wonderful! What a delicious sounding salad! I love mushrooms, but this is a different way to use them than I normally do! Will have to try it without the prociutto ;)! this looks amazing! i love mushrooms. I love all the ingredients in this salad, Claudia! I love all mushrooms and I'd definitely add the prosciutto and cheese. Ina does have very versatile recipes and the majority are winners--there are very few from her cookbooks that i wouldn't try to make and enjoy. I love Ina and I love this salad. Omit the prosciutto? No, no, no. 40-50 people come chez toi? Wow, Claudia. Sounds like you could write your own cookbook. My fav recipes are ones that use some form of fat! Loving these mushrooms. Fantastic meal Claudia! I love each dish of Ina's that I've made, so I'm sure this is a winner too. Love all those mushrooms. When my kids were young, I hardly used mushrooms because of my picky eaters. Now that everyone is married, I can indulge anytime. A super delicious salad! I like the prosciutto and the sun-dried tomatoes here. great salad...might try it this weekend for some guests I'm having over. Personally I'd cut the meat and keep the cheese, but it's all a matter of taste I guess! Lovely either way. I was able to pick up one of Ina's cookbooks just the other day. I still have not gone through it as thourogh as I would like. This salad looks amazing, what flavor you have going on here. yummy! My family loves mushrooms and I have bookmarked the recipe. It looks so delicious and I love all those flavours. It's hard to believe that Ina is so far down the list. I own four of her cookbooks and have used recipes from some of the others. She's a genius with recipes that are simple yet delicious, and I've been happy with every recipe of hers that I've tried. I haven't tried this one yet, but now it's on the list! I am so embarrassed that I haven't been here to read this post before now! Busy week, family stuff, etc ... that said, I am so glad I got here! This is a killer recipe! I love a warm addition to a salad! I love how it wilts down the greens just a bit and makes for a change up in the flavours of the greens just by the addition of the warmth ... that Ina! She comes up with good ones, doesn't she? I love Ina Garten and all of her recipes. This mushroom salad is completely in Ina style, rustic, generous and comforting. I have yet to find one of Ina's recipes that I did not love! A warm mushroom salad sounds wonderful to me. I think Ina could well be number one on the list, at least for me. I love her elegant but casual style. Frsh ingredients, but not fussy food. This salad is a perfect example. I'm trying it tonight. I love the addition of something warm to a salad. This salad looks really lovely and delicious. Beautiful and tasty salad with warm mushroom...somehow I really enjoy my salad topped with warm food. I'd heard about your crazy spring - warmer in MN than CA? I was so enamored with your mushroom salad. That looks incredible and even as a kid, I loved them. This is on my to do list. Yum! This looks delicious. I am so honored to have joined this group of outstanding chefs such as yourself. Your photos are lovely too! I love Ina and all her recipes are amazing! I haven't had one of her recipes that I didn't think was very good. I love mushrooms and this sounds great. Yum! This salad looks scrumptious! I haven't had a warm salad in a long while - almost forgot they existed! I am a huge Ina Garten fan and this salad looks wonderful! All her recipes are fantastic!! What a fantastic salad...love the idea and comforting thought of warm mushrooms! Beautiful!